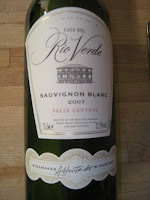 We had a bottle of Casa Del Rio Verde Sauvignon Blanc 2007 both in and with a seafood risotto. The risotto was lovely, with al dente rice, just the right blend of fish to rice and a creaminess that was neither sloppy nor stodgy. Heavenly. The wine was quite nice. It was pale and dry with a medium high acidity, just enough lemon to give it zing, enough apple to stop it being too citrussy, it was a little green with under-ripe grass if such a flavour exists. 12.5% alcohol was just about right, although for the money I’d rather have a Marlborough Sauvignon – there’s little difference in wine-miles so I wouldn’t feel guilty.